The Crow Mountains near Trutnov is a charming little mountain range located in the shadow of the famous Giant Mountains. If you wish to find yourself around the Cinderella of Czech mountains, the Crow Mountains is undoubtedly the ideal mountain range to spend the holidays. The range lays to the east of the famous Giant Mountains and is known for the inherent beauty of its encompassing mountains, over the decades earning the title of Cinderella. Amongst locals, the range is referred to as Vraní Hory. Aside from being nearby the Giant Mountains, its popularity is also overshadowed by the tourist reputation of the nearby rock formations of Adršpach and Teplice, providing a peaceful holiday alternative to the tourist hotspots of the Czech Republic. When mentioning the Crow Mountains, few are capable of pointing it out on the map. The name of the Crow Mountains is not even geographically correct and is almost exclusively used by tourists. The nickname given to the range by tourists is based on the incorrect identification of local populations of ravens as crows. In reality, the locals based the name of the mountain range on some of the robust and diverse geomorphological highlands of Broumov which account for a vast area east of the Giant Mountains, stretching along the Czech-Polish border. The most famous sights of this side of the country include the Rocks of Adršpach and Teplice. The mountain top of Královecky Špicák, with its height of 881 meters above sea level, the highest point of the Crow Mountains, is also recognized as the highest peak of the whole highlands of Broumov. Its name is not in vain, for hiking it is known to be an excellent daytime activity. The reward at the top speaks volumes. The eight-kilometer Crow Mountains ridge appeals to everyone because of its steep slopes, sightseeing points providing views stretching for miles, ice-age rock formations and an average height of approximately 400 meters. It is located east of Žacléř and extends across the border into Poland under the name Gory Krucze. Unknown views of the Giant Mountains. The Špicák in Královec offers an unusual view of the Giant Mountains. For example, although the mountain top does not rise as high above sea level as the the Sněžka, you will be to view most of the ridge as well as others from unique vantage points, providing a sense of tranquility and, with many hiking paths long-since established, it is possible to plan hiking trips that can last from dust till dawn. Under the hill you’ll find the mining town of Žacléř which is surrounded by villages such as Vrchová, Bečkov and the city of Bernartice, formerly a town of German heritage, which has retained much of its original character. From this vantage point it is also possible to view the Crow Mountains. You will not be likely to encounter many tourists when hiking in the Crow Mountains, but during the warm and sunny summer days, mountain bikers often venture into the ridge to exercise body and spirit. The Crow Mountains ridge lies in the shadow of the Giant Mountains, not just figuratively but also in more literal a fashion. Its laying provides it with cover from the rain. In comparison to the ski center Prkenný Dul nearby Žacléř, less snow falls around the area in times of winter, but during times of summer it is possible to find a species of Sempervivum Tectorum, a succulent plant, on the rocky slopes. The lesser-known mineral assemblage of Rhyolite is won in the quarries surrounding the local mountains. While walking about the Crow Mountains, you will be rewarded with the preserved deciduous forests and the previously mentioned exceptional views of the Giant Mountains, experiencing the best Czech nature has to offer. The Crow Mountains owe their steepness to historic volcanic activity in the area which has left a strong mark on the landscape. This activity acounts for the sharp hill. ls that are clearly visible from afar. There are bountiful special features such as rock formations spread across the vicinity. 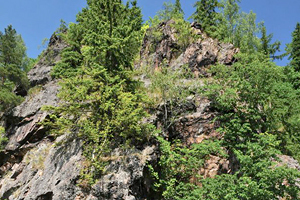 The stunning Devil's ravine of Bečkov is decorated with rhyolite rock and deserves utmost attention of any tourist and local alike with an interest in ancient rock pillars. 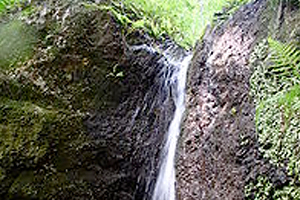 Crafted within the hills of Bečkov is a wall, which, in turn, contains an extraordinary strong source - the Waterfall of Bečkov.